Hyperbole and shadiness and greed, oh my! A friend links me to a curious video on the monetary and fiscal system of the United States. This video has a tone we've grown accustomed to over the past several years: accusing the powers that be of conspiracy and theft of the American People, and recommending the re-adoption of the gold standard as the basis for monetary worth. The video actually gets many (most) of the facts right, but the conclusions it draws are misguided, and betray a fundamental misunderstanding of debt's role in the economy, as well as the deep-seated biases of the author, whose ultimate goal is selling the viewer gold in exchange for US dollars. Buyer beware: Speculating on gold may make you money from market movements, but it does not generate any interest payments! Not to mention speculating on gold last year would have lost you a lot of money. So let's break down a few of the less-than-accurate claims this video makes. Most importantly, let's address the statement that "Debt is stealing from future prosperity", and that these are debts the next generations will have to pay. This really demonstrates a misconception of what government debt represents. Unlike private sector debt, government debt is, to a first approximation, debt we owe to ourselves (Foreigners like China do buy some debt, but not a huge share of it, and the potential consequences from a hypothetical loss of investor confidence in current conditions are not exactly scary). Because of this, when the government borrows money from an investor for cash and issues a liability in the form of a bond, the investor holds that same bond as an asset -- the author is ignoring the other half of the effect on the balance sheet! So because America itself is financing its government borrowing, the only way this could be making us poorer is if it were "crowding out" private investment, which would diminish our future productive capacity. This is a joke: businesses are sitting on huge piles of cash, and are reluctant to invest because of a slump in demand -- all the while, there are tons of idle resources throughout the economy. In fact, issuing new government debt is actually a good way to try to take those idle resources off the sideline and put them to good use -- or at least, it would be if the government invested the borrowed money in projects that improve our productive capacity, like upgrading infrastructure or overhauling our education system. And with government borrowing costs still near historic lows, there really is no time like the present to invest away. While infrastructure and education would be great investments that would create jobs today and tomorrow, the Federal Government could actually do a lot of good by simply sending this borrowed money directly to states, where they could help stem the vicious cycle of layoffs and cutbacks to vital public services. Indeed, anything to mitigate the national disaster of long-term unemployment would be a huge help to our long-term growth prospects, which is the primary driver of our borrowing costs and thus our ability to repay debt. Unfortunately, Republicans in Congress refuse to asset to any increased spending on anything other than defense, so our prospects for productive movement here are practically nil (if you're still worried about profligate spending, you should in fact be rejoicing at this fact). A little common sense should tell you the author must be missing something; after all, US Government debt peaked during World War II, and the economic growth both during and after the war were about as good as is gets. (Note that the brief recession occuring in 1946 was a result of the economy having outproduced its peacetime potential during the war years -- the years that followed saw robust, consistent growth). Let me try to illustrate why issuing government debt isn't necessarily a bad thing using a simple example. Imagine a small island nation, which for the sake of this example doesn't trade. The national government borrows some money from some of its wealthiest citizens and promises to pay them interest on this debt over the course of the next few years, and uses this borrowed money build some new schools. The investment pays off: economic activity increases thanks to a better educated and thus more productive workforce, and the country recoups the interest cost it incurred by borrowing through increases tax revenues borne solely out of higher GDP (GDP growth > Interest rate). The wealthy investors are happy from the interest they earn, and the workers are happy to have greater earning potential today and going forward. And this happy outcome was directly facilitated by the government's ability to spend now and pay later: to borrow. So debt can be a really positive thing. What about inflation? Many of us were taught as youngsters to fear inflation. But given that economic movements will be volatile, inflation is the lesser of two evils, the other being deflation. A deflationary cycle is notoriously difficult to break free of and can rob advanced countries of previously dynamic growth, as Japan's experience in the past decade-plus would show. Meanwhile, the Federal Reserve has gotten pretty good at reeling in inflation in the past few decades by cranking interest rates up and engineering recessions when prices stark to climb too quickly (today's inflation rate of 1.2% is actually well below the 2% rate the Fed purports to target). This video characterizes inflation as a tax on all Americans -- a popular meme to be sure, but let's think about who that tax is really costing. It is those who hold great lots of their wealth in currency and assets whose value is denominated in nominal dollar terms (think: investors in existing mortgages, people who hide their savings in their mattresses) that would bear the brunt of this erosion of value. Inflation is an incentive to take money off the sidelines and invest in productive endeavors. The purchasing power of an hour of labor, on the other hand, is not so adversely affected so long as wages are rising with inflation. And considering we are still trying to whittle down our debt levels, a brief jolt of elevated inflation may indeed greatly help to accelerate the recovery. So inflation helps some and hurts others, but would on balance benefit the whole economy and particularly people with large nominal debt (sounds like the middle class, doesn't it?). A couple less important quibbles with the author's hyperbole: he characterizes fractional reserve banking as "stealing" from depositors to make loans. This is a wildly over-simplistic view, considering this is how banks have always made money. Indeed, this is the very mechanism by which they expand the money supply and fuel economic growth. If a firm borrows money from a bank, uses it to build a factory, and uses its profits to repay the bank, there is nothing artificial about that growth! Banks are required to keep a certain proportion of their deposits on hand in reserves, and in fact since the recession they have been holding far more than required (these are called excess reserves). And even if their loans do go bad, all bank deposits in the US are guaranteed by the FDIC: the depositor's money is never in jeopardy. Now, whether this guarantee presents a perverse incentive for the bank to make risky loans is another question, but the author makes no such argument. 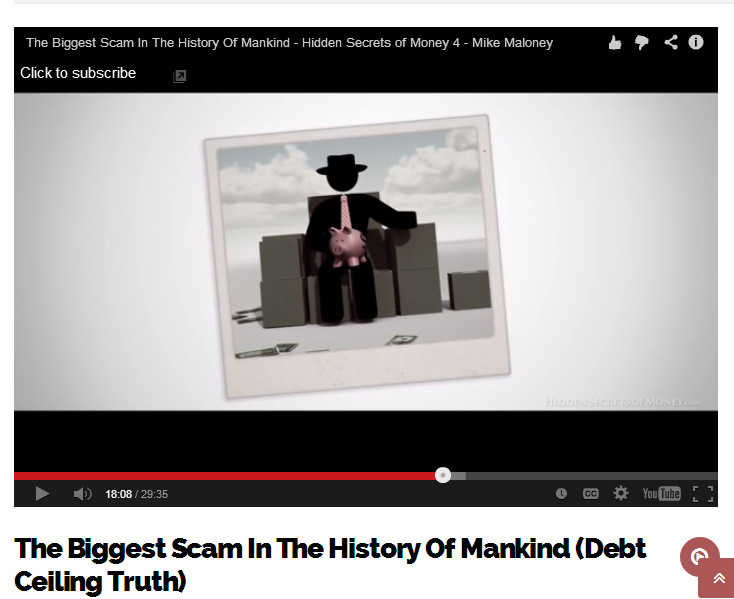 At one point, the video posits that paper money is a "claim on debt." This is false: Think instead of money as a tax credit. Indeed, this is the ultimate source of fiat money's value, and why holding so-called "currencies" like Bitcoin is really pure speculation, since no government would accept Bitcoins for tax payments, and the Bitcoins are not pegged to any commodity or sovereign's currency. Basically, if you want to live or do business in the US (and really, who wouldn't? ), everyone is going to expect payment in US dollars, because that's the only form of payment the US Government (backed by its armed forces) will accept when collecting taxes (or fees, fines, etc.). The same goes for Canada and Canadian dollars, and the UK and the Pound Sterling. And by eschewing the gold standard, we free up a good lot of society's resources to actual productive uses, instead of devoting these resources to mining some yellow metal from the ground. Floating fiat currency is thus a lightweight way to facilitate transactions throughout the economy. Now then, the video is on point to say the debt ceiling is a 'delusion', but not for the right reasons. The debt ceiling is a farce that accomplishes nothing but to provide a minority party the opportunity to extort the majority for political gain on the threat of catastrophic default. As a nation, we decide how much to raise in taxes and how much to spend on programs. If we collect more than we choose to spend, we run a surplus. If we choose to spend more than we collect, we run a deficit. If we run a deficit, we must borrow (i.e. issue debt) to spend as much as we designed. So once the decisions on what levels to spend and tax have been made, the act of borrowing is simply obligatory. So to have to separately authorize the government to actually borrow the money is ludicrous -- we have already agreed we will need to borrow when we passed a budget! So yes, the debt ceiling is a delusion, and should be eliminated, permanently, since it serves no purpose other than to inject instability to the fiscal process. The producer of this video trying to stoke your confusion, fear, and anger at the system, and channel those emotions toward a transaction of their choosing. Anger sells, so be careful what you pay for. When issuing government debt, there's a risk that it will be repaid with taxes (as opposed to rolling it over forever). Indeed, without that risk, debt wouldn't be a true debt; it would be a bubble like bitcoins. Money is indirectly backed by taxes, because the Fed buys government bonds (which is not very different from directly lending to the government). But if the Fed were prohibited from buying government bonds, then money wouldn't be backed by taxes. It would be backed by mortgages, or whatever else the Fed might buy.